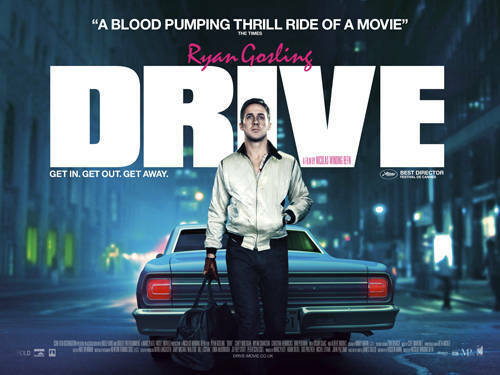 As I sit and listen to the soundtrack to Nicholas Winding Refn’s 2011 film Drive, I can’t help but to think how many cool points I just accrued. The film stars Ryan Gosling and Carry Mulligan as star-crossed lovers in the modern age. Gosling’s character who is only known as the driver is a character for the ages. This generation’s Steve McQueen. Refn’s ability to make Gosling into, what can only be described as, a genuine action star is nothing short of amazing. Much like Refn’s previous films (Bronson and Valhalla Rising specifically) the hero is damaged in ways that are not readily apparent to the audience. When we first meet the driver he is playing the getaway driver to a robbery. The nature of the robbery is unimportant, what is important is the calmness that is exuded from Gosling while panic and uncertainty are all around him. As the film goes along we get small but significant glimpses into what makes the driver who he is and why we should care about him as the audience. The first 30 minutes of the film we are given a look at how Gosling and Mulligan establish their obviously doomed relationship. The chemistry between them is less in dialogue but rather in glances and slight smiles. This method of unfolding their attraction gives the audience a chance to put themselves in the situation and guesstimate what Mulligan and Gosling are really thinking. Like a duck on the surface of a lake all the fury and intense happenings are just below the surface. That intensity drives the duck and this film forward, seamlessly. After Oscar Issac, who plays Mulligan’s husband, returns from jail the more obvious tension sequences begin to take shape. When a robbery goes wrong and Issac’s character is killed the white knight that we have grown fond of changes and becomes more like us than we would care to admit. The mob, the villain, the mad man. Ever the hero, the driver sacrifices his chance with Mulligan to be the better man. The scene in which Gosling morphs from the sweet, yet slightly creepy guy, to the needed mad man is beautiful. Refn’s control over the soon to be infamous elevator scene shows his real skill as a director. The violence is incredibly visceral and hard to watch at times. If you have seen Refn’s aforementioned previous films this will come as little to no surprise. Refn’s film ends with our hero doing what he has to do and that is what makes the movie really work. Tons of movies address the revenge themes, but few make you feel like you could bring yourself to do what you see done on film. However, in Drive, you feel like you could do it, but you would hate yourself for it. Gosling is able to pull off something that just isn’t common anymore. You want him to win, but more importantly, you want to be him. That is why in the end you have a sigh of relief because its over for the protagonist and for you. Go see Drive.